The Carrion Crow is a brother of the Hooded Crow. In Europe, there is only a small area where they both live. 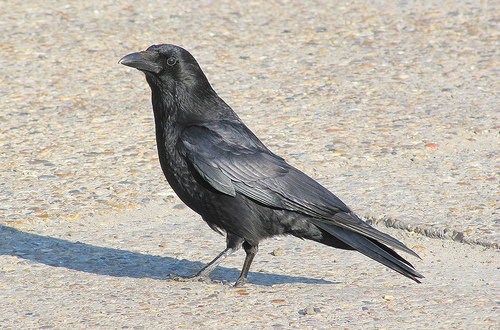 The Carrion Crow breeds in the western part of Europe, while the Hooded Crow only lives in the eastern part. The Carrion Crow is entirely black, the Hooded Crow has grey wings and a grey belly. 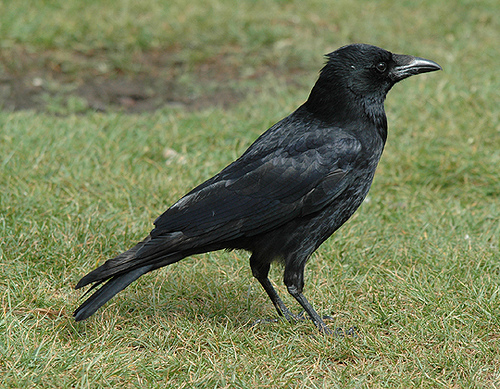 The Rook's base of the beak is light grey. The Carrion Crow's head and beak are completely black. The Carrion Crow is completely black and has a sharp beak. The Jackdaw has greyish feathers and a smaller beak.